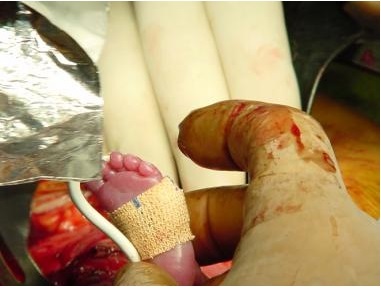 Eleven years ago while giving an anesthetic for a ruptured ectopic pregnancy (at two months gestation) I was handed what I believe was the smallest living human being ever seen. The embryo sac was intact and transparent. Within the sac was a tiny (approx. 1 cm.) 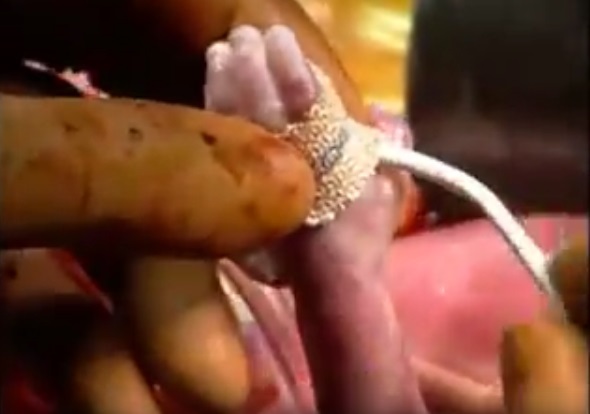 human male swimming extremely vigorously in the amniotic fluid, while attached to the wall by the umbilical cord. 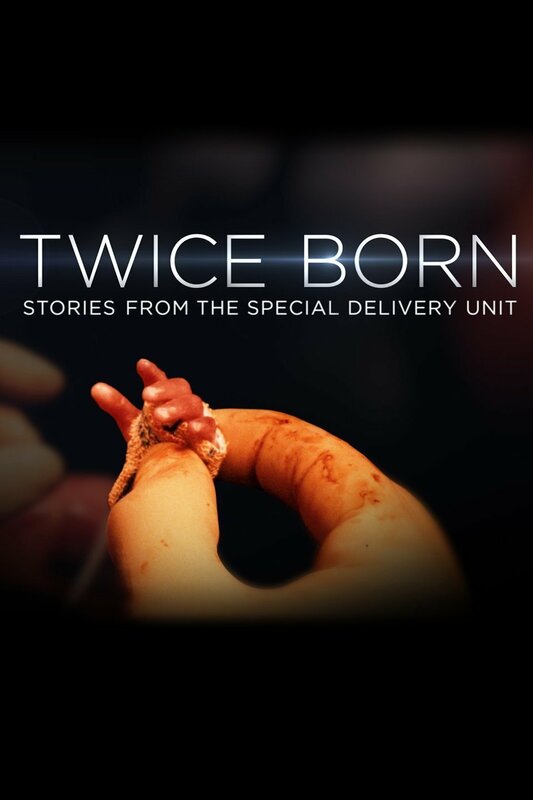 This tiny human was perfectly developed, with long, tapering fingers, feet and toes. It was almost transparent, as regards the skin, and the delicate arteries and veins were prominent to the ends of the fingers. The baby was extremely alive and swam about the sac approximately one time per second, with a natural swimmer’s stroke. This tiny human did not look at all like the photos and drawings and models of “embryos” which I have seen, nor did it look like a few embryos I have been able to observe since then, obviously because this one was alive! 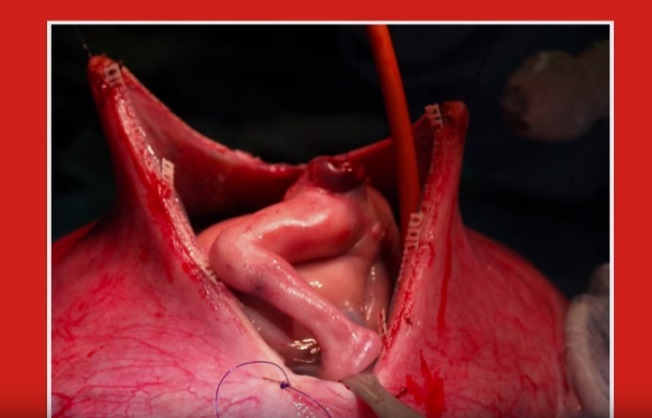 …When the sac was opened, the tiny human immediately lost its life and took on the appearance of what is accepted as the appearance of an embryo at this age. It is my opinion that if the lawmakers and people realized that very vigorous life is present, it is possible that abortion would be found much more objectionable than euthanasia. Rockwell went on to describe gruesome abortion procedures being used at that time, including the saline abortion (see Baby Choice) and hysterotomy abortion, as shown in this 1981 Hayes Publishing pro-life brochure (graphic image warning). 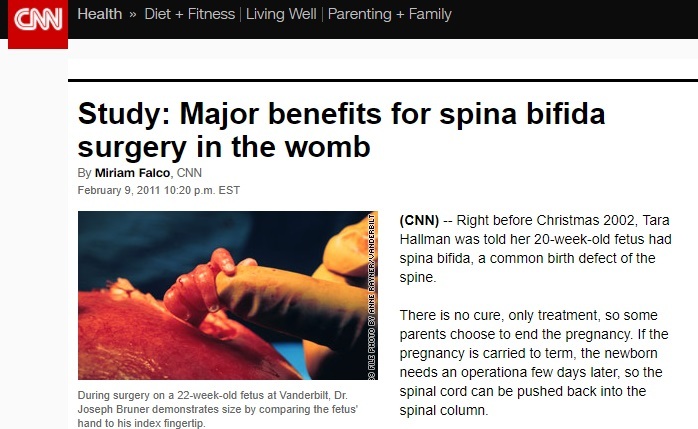 “… to dilate the entrance to the womb, then insert a large forceps and drag out the baby and the afterbirth. This is not as easy as it sounds. The surgeon must work by touch alone. He gives a tug – a tiny arm comes away; then other fragments of the body. The head is always difficult; the skull gets crushed; the eyeballs protrude. All the time the bleeding is profuse. 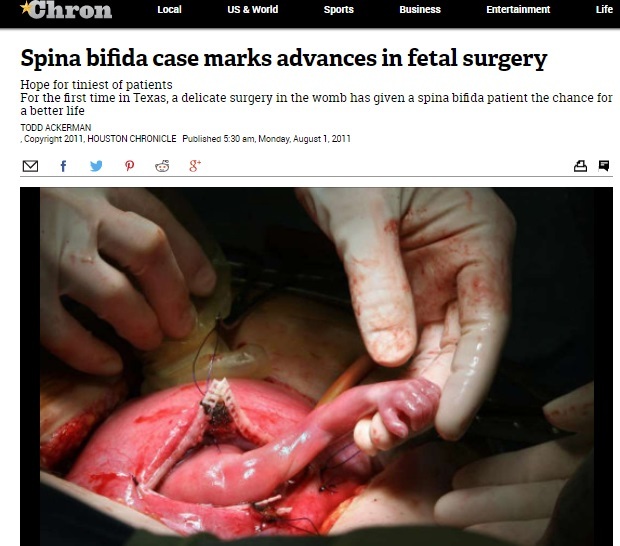 When the abortion has been completed,” writes Dr. Dunn. “Abortion is a brutal and violent procedure, which is fundamentally repugnant to the philosophy of medical practice,” Byrn stated. 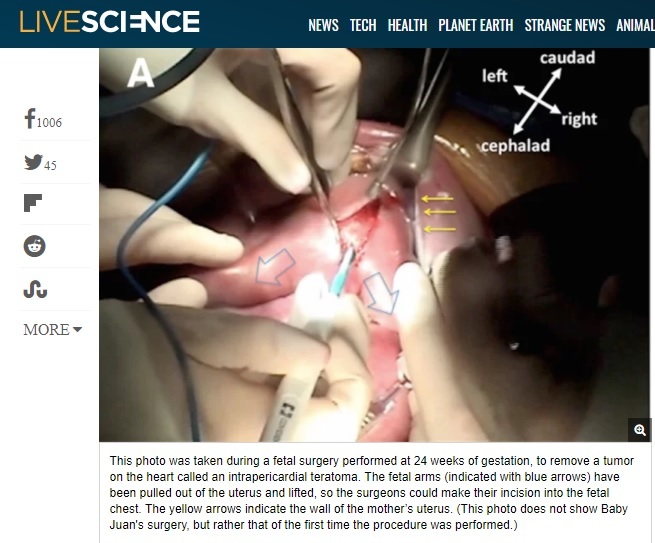 Fetal surgery is becoming more and more common, saving lives and improving the conditions of preborn children. 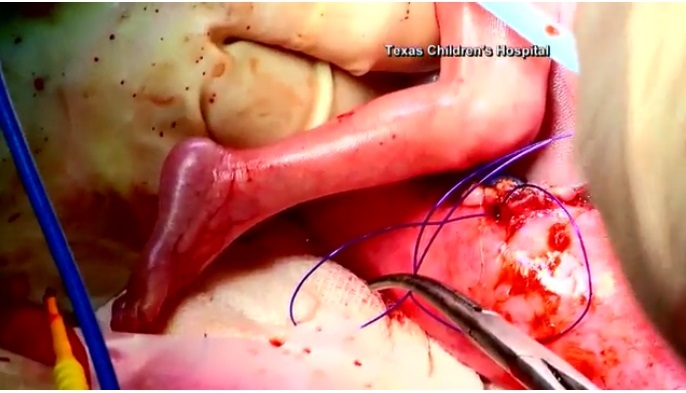 Like many other medical advances, open fetal surgery (as displayed in the images below) offers an amazing look at the developing person inside the womb. 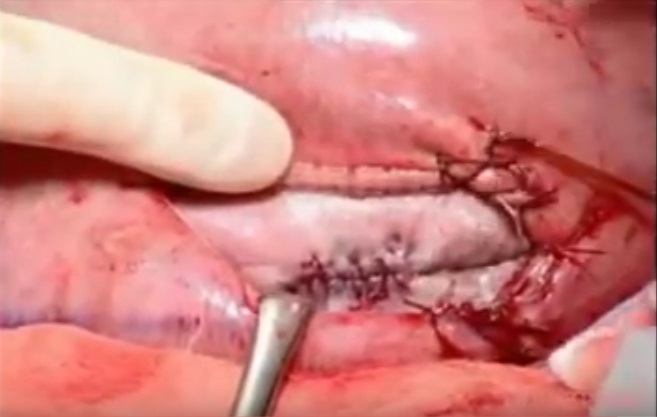 Images and videos below are of surgical procedures and may be disturbing for some viewers. It is amazing the extent to which members of the medical profession will go to save preborn children growing inside their mother’s wombs. Tragically, there is an inhuman side of “medicine” as well, which believes that ending the lives of other preborn child in an abortion is the better solution. 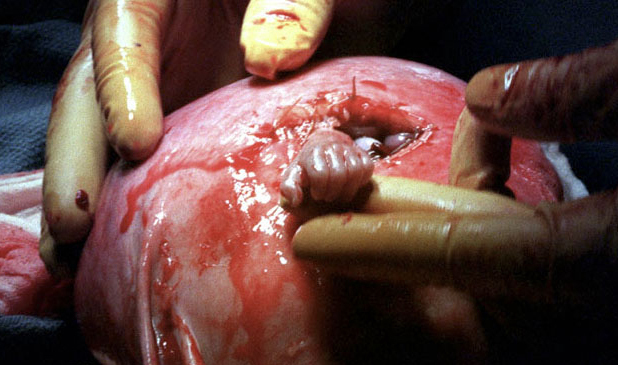 We long for the day when abortion in unthinkable. 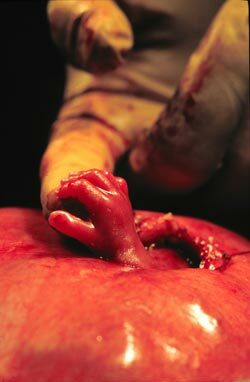 Until then, these tiny persons in the womb testify of their humanity. The administrative complaint, filed with state Board of Medicine’s department of licensing and regulatory affairs for possible disciplinary action and obtained by Live Action News from pro-life advocate Lynn Mills, details the abortion doctor’s sordid past. In the factual allegations, the document states that Roth was disciplined by the state medical board in 2004 following a complaint that he performed an abortion out of a patient’s home. Another issue came before the Board in 2012 over a complication from a procedure resulting in a fine. The Attorney General has accused Roth with being in possession of controlled substances without lawful authority. According to the AG’s complaint, when police searched Roth’s car they discovered 6 prescription bottles containing an antibiotic prescribed by another medical doctor with the initials AO for several patients as well as large amounts of the pain medicine Fentanyl and a partially used bottle of a drug used for anesthesia. In addition they found medication used for uterine bleeding. Mills said she suspects Roth was doing clandestine abortions, wondering where he was performing them, “Roth was driving around with what he needed the antibiotics, the anesthesia, the bleed control meds and pain meds. Where’s the bloody pads, the cannulas?” While authorities have not specified why Roth was in possession of the medications, Mills speculated a few possible scenarios such as his performing secret abortions on rich women or even on human trafficking victims in secret locations. In addition to the medications, the complaint states that police also found “Fifteen specimen jars containing the “products of conception” in the abortionist’s car. Less than a week later, upon searching Roth’s home, police found additional medications of Fentanyl and and 6 full glass vials of Methylergonovine Maleate (medication used for uterine bleeding). Police also discovered that the Fentanyl, which had expired a year earlier, belonged to another physician. In fact, several of the medications found in Roth’s possession were expired and bore the name of to another prescribing physician where Roth “provides coverage” according to the complaint. The documents states that the license to dispense medications are “location specific” and that medications cannot be stored in places other than where the license allows. Further, state law requires that medications are to be stored in a locked cabinet or room and not in a person’s home or vehicle. The complaint accuses Roth of failing to protect patient’s personal information as well as disposing of “pathological waste” i.e. aborted babies pursuant to state statutes. A recently leaked tape recorded at a National Abortion Federation event captures one abortion owner joking about the need to burn the fetuses her clinic aborted in a field, something that another doctor actually did. The comments came from Renee Chelian, owner of the Michigan abortion clinic chain, Northland Family Planning who also told her NAF audience that if it weren’t for the “PR nightmare” she thought it would be a “great idea” to burn the remains of aborted babies for energy. Sadly, using aborted children for energy is not a new idea. In 2014, CBS reported that an electricity generated in Oregon may have included aborted babies. And, a 2014 UK Telegraph report found that the remains of more than 15,000 babies were incinerated as ‘clinical waste’ by hospitals in Britain with some used in ‘waste to energy’ plants. Earlier in the conversation, the abortion owner joked about wanting to take aborted babies from her clinic into a field and burn them. 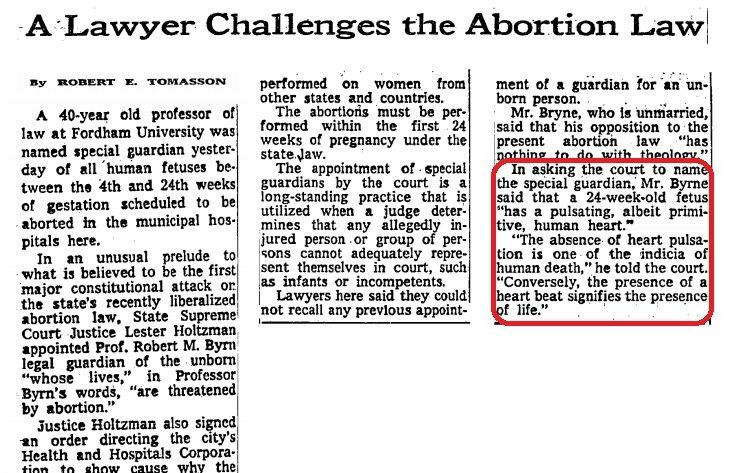 The trouble is, that idea has previously been carried out by another abortion doctor also making headlines this month. “Um…Nobody wants to talk about dead bodies. Um, and nobody but me. I’m just saying. There was a point when Stericycle fired us that I had 5 months worth of fetal tissue in my freezers. We were renting freezers to put them in,” she says about her frustration over where to take her clinic’s aborted preborn babies for disposal. 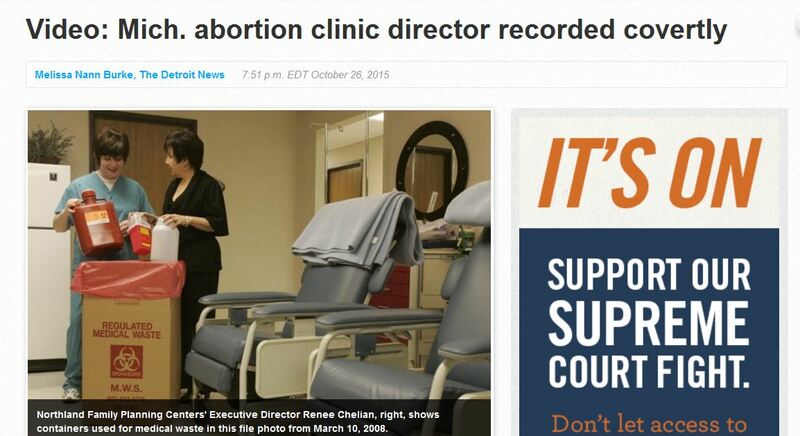 Ironically, although Chelian joked about dumping fetuses somewhere in the woods and burning them, an Oklahoma abortion doctor once admitted doing that precise thing for the exact same reasons that Chelian outlined in her speech. 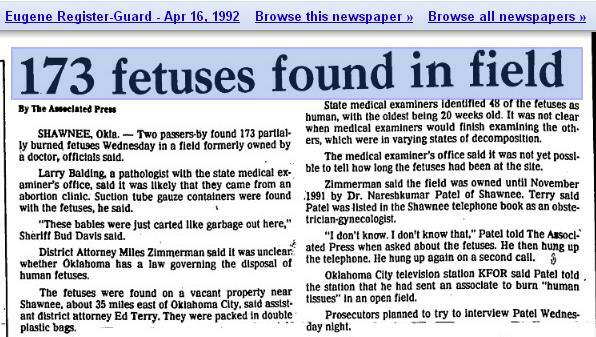 In 1992, Dr. Nareshkumar Patel was investigated for burning a large amount of aborted children in a field near Shawnee. 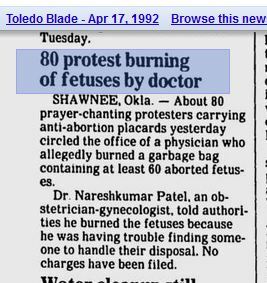 A 1992 Toledo Blade article on Patel read this way, “Dr.Nareshkumar Patel, an obstetrician-gynecologist told authorities he burned the fetuses because he was having trouble finding someone to handle their disposal.” Did you hear that Renee Chelian? Patel has already disposed of aborted children in the sick way you suggested and guess what, he was never prosecuted for doing so. You just can’t make this stuff up! In fact, the only reason charges were not brought against Patel at that time was because there were no laws on the books to prohibit the heinous act. “There’s no criminal law that can be applied,” District Attorney Miles Zimmerman said at the time. Now, almost 23 years later, Patel has found himself in trouble again. 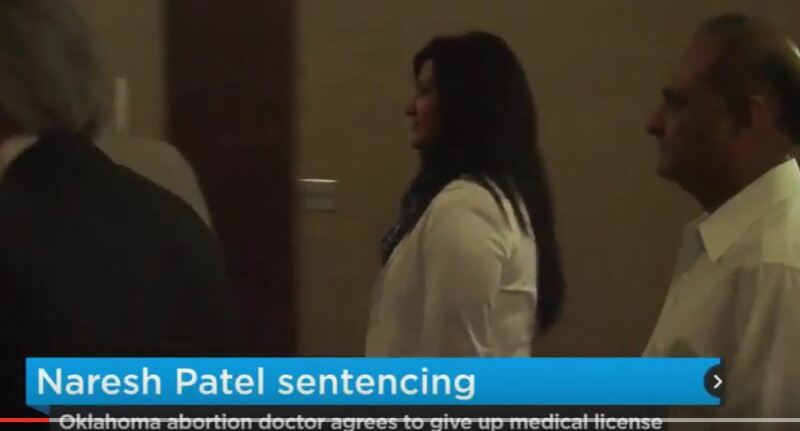 This month, Patel was sentenced to several days in jail for performing abortions on women who were not pregnant. Patel, whose sordid history also includes accusations of sexual abuse, was ordered to serve 18 days at a correctional facility after he pleaded guilty to the charges. Patel also agreed to pay a $20,000 fine and never practice medicine again nor own any interests in any more abortion facilities. You can read details of that case here.